Book Review: The Burning – B00KS in Paradise! Alice Leininger has two adorable kids and husband who loves her. She doesn’t have to work and spends all of her time volunteering with her best friends for the Freedom Project, a charity helping young girls and women get off the streets. She has a perfect life…until she starts hearing voices and losing consciousness more often and for more extended periods of time. As Alice tries to figure out why she blacks out and what happens during that time, she suddenly finds the police at her door. The next thing she knows, she’s being charged with arson and murder. As Alice sits in a mental institution awaiting trial, she wonders how far she would go for justice and is she really capable of murder? 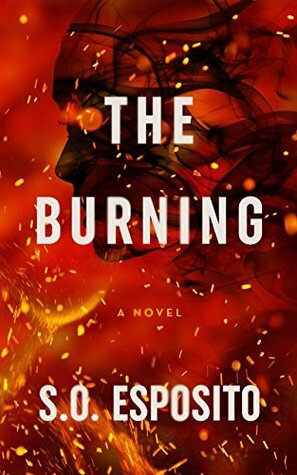 The Burning is one of the best psychological thrillers I’ve read that explores dissociative identity disorder (DID) or what most people know it as, multiple personality disorder. The Burning does start out slow as it fills in the background for Alice, however, once Alice starts seeing a psychologist and starts diving into DID, the novel picks up quickly! Most of the supporting characters fell a little flat making it challenging to stay interested, but the plot line is phenomenal. The characters I loved the most and always wanted more of were Alice’s different personalities! I really loved how Esposito was able to create characters within her main character! She also did a great job of letting the reader decide, is Alice the villain or is she the hero? Not only does The Burning explore DID, but it also has underlying themes of sexual assault and human trafficking. With everything that has been going on the USA recently, I think The Burning has effectively brought up issues that need to be discussed. It wasn’t too much or over the top, but gave multiple perspectives from both sides, what it’s like to be sexually assaulted, what it feels like when the people you trust don’t believe you, and what some women go through on a regular basis to make a life for themselves. The Burning was inspired by a piece of short fiction Esposito wrote in 2012 and the election of 2016 that occurred in the USA. She did a fantastic job of turning her short fiction into a piece of art! The Burning was an interesting and exciting read. Definitely wasn’t fast-paced, to begin with, but once it picks up, you start racing through each chapter. Esposito did an excellent job of creating a likable protagonist and an awful and really unlikable antagonist. She confronts social issues that need to be addressed out in the open while also showing things can and will change for the better. As Esposito’s first try at a psychological thriller, I thought she did a fantastic job, and I can’t wait to see what she comes out with next! I will totally put more of her mysteries on my never-ending TBR!